A brand new Registration Site is in the works to improve how your customer’s interact with your organization! We want to give you a sneak peak to some of the mobile first design as well as answer some questions to let you know what to expect next. Select the link in the screenshot below to watch a demo. What features are part of the initial release? What Registration Types are part of the initial release? 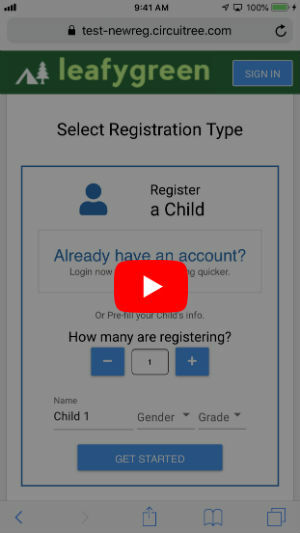 Child will be the first Registration Type that is available. Once that is released, Family, Group and Self will follow. At this point, we don’t have a firm date, but we are working hard to get it in your hands soon! Here is an outline of our Development process for the new Registration Site. Currently, we are in the Internal Testing phase where we are tracking down any last-minute items that need to be fixed or polished to make it great for your customers. Once that is complete, we will be releasing to Test to allow you to try with your own Events. At the same time, we will be conducting user testing to make sure that everything is ready to go. When Testing is complete, you can choose for your company when we release to Live. How will the Registration Site be released? Once the Registration Site is ready for release, you can opt-in to using it for your Registrations. You will have a link to a different site that you can publish to allow customers to register using the new experience. You can run this site alongside your existing site if desired. Do I have to switch over now? No, you can choose to switch over to using the new Registration Site when you feel comfortable. How much will I need to configure? Depends. There are new features in Event Configuration that allow you to edit the name of a Step or add a step multiple times [like Attributes]. If you want to take advantage of those features, you would need to configure them. There are also lots more Content Fields that you can update if you so choose. We are excited for you to experience the new Registration Site and see all that it has to offer your customers.